The powwow committee would like to announce that this year’s traditional Powwow “All our Relations” was a huge success. Congratulations to this year’s contest winners for the Ogichidaa and Ogichidaa Kwe- Calvin Boissoneau and Melina Jones-Reid. Your positive attitudes and behaviors were well presented over that weekend and we will look forward to your positive input to the community for the following year. Meegwetch to Lori Boissoneau for making the beautiful sash and medallion for our winners. They are gorgeous, and we know that our Ogichidaa and Ogichidaa kwe will display them with pride throughout the year. We could not have done it without all the help and direction from the Garden River First Nation Fire Department, Public Works Department and students. 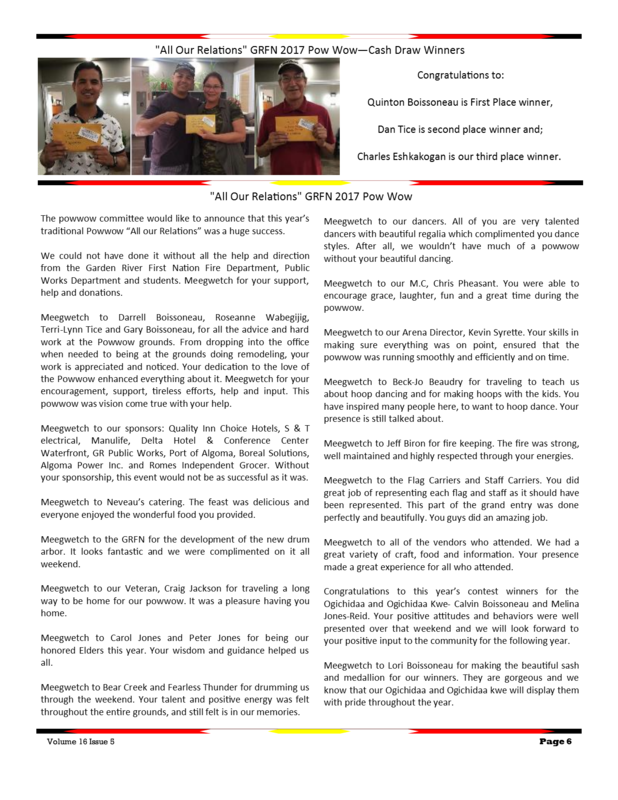 Meegwetch for your support, help and donations. Meegwetch to Darrell Boissoneau, Roseanne Wabegijig, Terri-Lynn Tice and Gary Boissoneau, for all the advice and hard work at the Powwow grounds. From dropping into the office when needed to being at the grounds doing remodeling, your work is appreciated and noticed. Your dedication to the love of the Powwow enhanced everything about it. Meegwetch for your encouragement, support, tireless efforts, help and input. 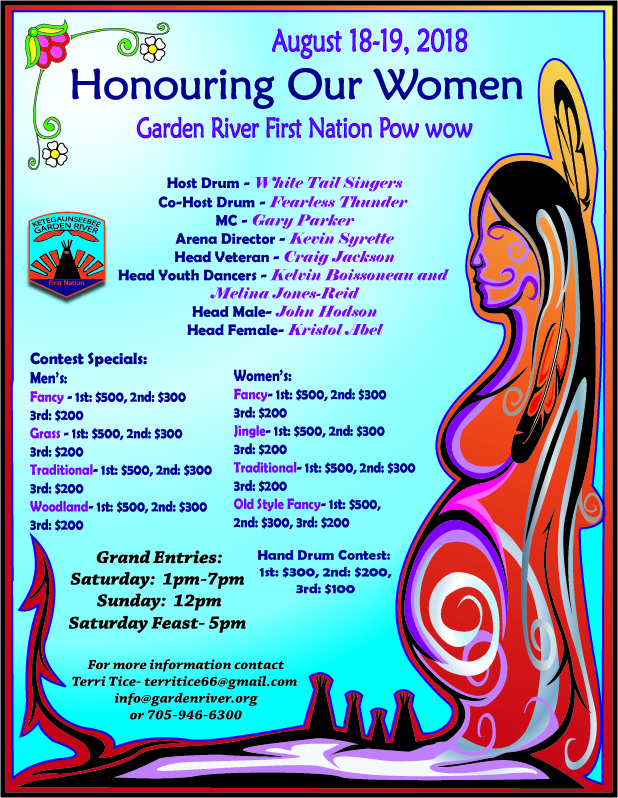 This powwow was vision come true with your help. Meegwetch to our sponsors: Quality Inn Choice Hotels, S & T electrical, Manulife, Delta Hotel & Conference Center Waterfront, GR Public Works, Port of Algoma, Boreal Solutions, Algoma Power Inc. and Romes Independent Grocer. Without your sponsorship, this event would not be as successful as it was. Meegwetch to Neveau’s catering. The feast was delicious and everyone enjoyed the wonderful food you provided. Meegwetch to the GRFN for the development of the new drum arbor. It looks fantastic and we were complimented on it all weekend. Meegwetch to our Veteran, Craig Jackson for traveling a long way to be home for our powwow. It was a pleasure having you home. Meegwetch to Carol Jones and Peter Jones for being our honored Elders this year. Your wisdom and guidance helped us all. Meegwetch to Bear Creek and Fearless Thunder for drumming us through the weekend. Your talent and positive energy was felt throughout the entire grounds, and still felt is in our memories. Meegwetch to our dancers. All of you are very talented dancers with beautiful regalia which complimented you dance styles. After all, we wouldn’t have much of a powwow without your beautiful dancing. Meegwetch to our M.C, Chris Pheasant. You were able to encourage grace, laughter, fun and a great time during the powwow. Meegwetch to our Arena Director, Kevin Syrette. Your skills in making sure everything was on point, ensured that the powwow was running smoothly and efficiently and on time. Meegwetch to Beck-Jo Beaudry for traveling to teach us about hoop dancing and for making hoops with the kids. You have inspired many people here, to want to hoop dance. Your presence is still talked about. Meegwetch to Jeff Biron for fire keeping. The fire was strong, well maintained and highly respected through your energies. Meegwetch to the Flag Carriers and Staff Carriers. You did great job of representing each flag and staff as it should have been represented. This part of the grand entry was done perfectly and beautifully. You guys did an amazing job. Meegwetch to all of the vendors who attended. We had a great variety of craft, food and information. Your presence made a great experience for all who attended. On behalf of the Powwow committee, I give a thousand meegwetch’s to all of you. It was a wonderful powwow and it could not have been done without the contributions made from all of you. 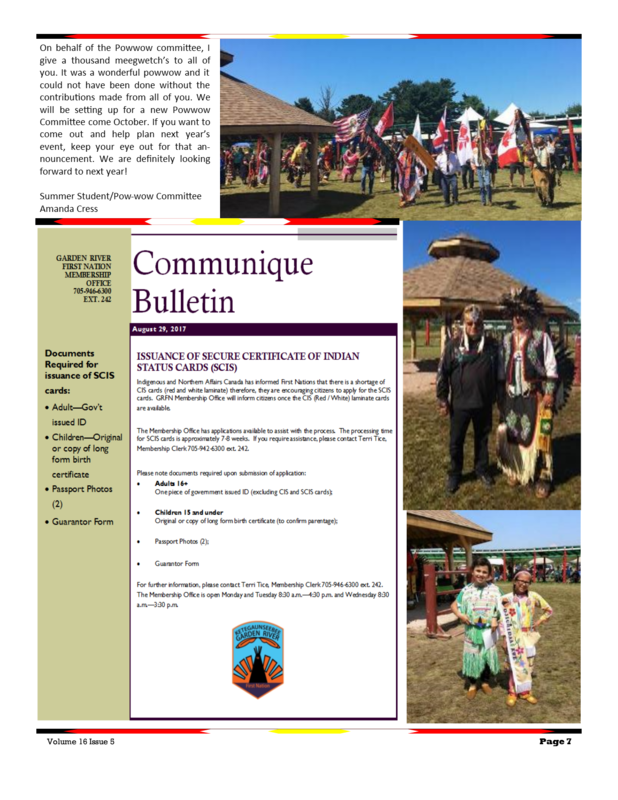 We will be setting up for a new Powwow Committee come October. If you want to come out and help plan next year’s event, keep your eye out for that announcement. We are definitely looking forward to next year!